Hi guys! I FINALLY filmed another vlog...the unboxing of my first LE TOTE ! 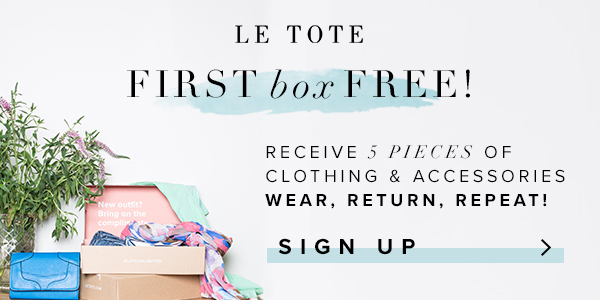 Le Tote is a clothing rental subscription company. They send you 3 pieces of clothing and 2 accessories and you can wear them as many times as you want in a month before sending them back (dirty!) and getting another selection next month. Or if you send the items back sooner, you can get another box the same month. It is $59 a month, and if you like something, you can keep it at a reduced price. I'm SUPER excited by the items in my first box and can't wait to wear them. Have you tried LE TOTE ? What did you think? This is NOT a sponsored post but the links are affiliate links :) Try it free for 14 days! !